Great. So just think of the verb as having “to” in front of it and then it will be easy. …beth dwi’n moyn/eisau dweud = what I want to say. Yes - and isn’t it interesting as well that when the naughty Gogs say …na lasa fo… they’re applying the SM (after na, of course) to the LL that used to be in the middle of the original word. I thought mutations had to do with something preceding the mutating words. But maybe not! I keep on finding i mewn and i fewn and I don’t understand why one or the other. And then why sometimes it’s tu mewn? Possibly, they just aren’t applying the mutation every time in real life. I’m not an expert with mutations, far from it, but going from ‘m’ to ‘f’ is a soft mutation and Christine Jones has 31 rules. I don’t know which rules apply, but I suspect several. 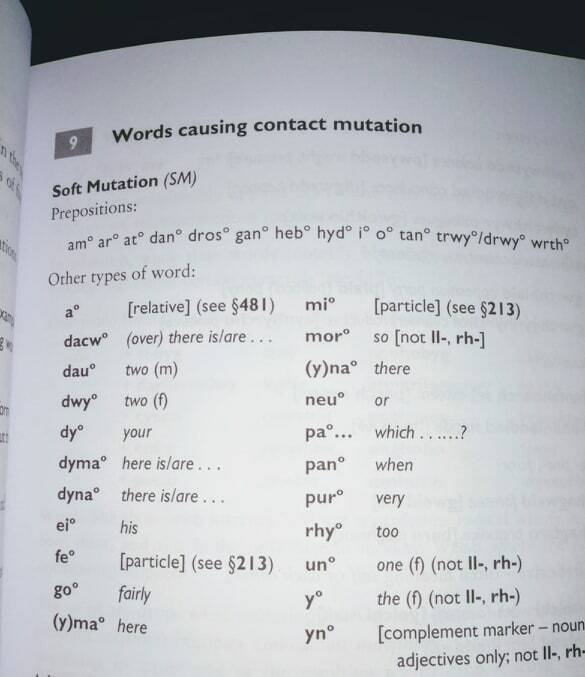 @garethrking’s dictionary has a good section in the front summarizing the rules for mutation. Whenever I have a question I refer to that, even before the grammar book. You can tell because the pages are coming loose! According to Christine Jones and her book, there are 49 rules for mutations. That is a bit intimidating, I think, and not really true as RULES. All mutations are either contact mutations (caused by a preceding word) or grammatical mutations. NM has contact mutations only. AM and SM have both (though actually AM only has the one grammatical instance). And remember that 90%+ of instances of mutation in the living language are SM - so master that first. I believe you can get something for this from the chemist these days. Oops to both of you! Thank you for clarifying about them NOT being rules, and I’ve always felt the number was intimidating but there are so many members who say, don’t worry about, that I don’t. Thank you for your brief summary! @garethrking’s dictionary has a good section in the front summarizing the rules for mutation. Yes - there are only 49 (or whatever) ‘rules’ if things like ‘SM after gan’ and ‘SM after neu’ count each as a separate ‘rule’, I suppose. Not helpful, I think - just hand out a list of all the words that cause SM (30-odd) and order everyone to learn them by 9.00 Monday morning or else. Simps!! I think “i” does account for more than it’s fair share of soft mutations. I remember being in a cafe in mid Wales (can’t remember the name of the place off the top of my head, lots of waterfalls and bridges) and after ordering beans on toast “heb menyn” among other things the lady repeated the order back to me and with a little deliberate glance up and a smirk said “heb fenyn”. I said “those darn soft mutations” and a younger girl behind the counter realed off this list … ‘am’, ‘ar’, ‘at’, dros’, ‘drwy’, ‘dan’, wrth’, ‘o’, ‘i’, ‘heb’, ‘tan’, ‘gan’ … without thinking saying that it was drilled into them at school from an early age. I really should learn it, and I will one day … one day. I really should learn it, and I will one day … one day. No time like the present, @gruntius - and it will improve your Welsh no end, as well as making you feel wonderful! C’mon - 30-odd little words…you can do it!! Jeepers, I’ll even give you the list!